Private lessons (for children and adults) – Students meet privately with their teacher once a week, learning at their own pace. Students have the opportunity to learn to read sheet music, as well as learning vocal technique such as posture and proper breathing. Want to enroll in voice lessons? Click here! 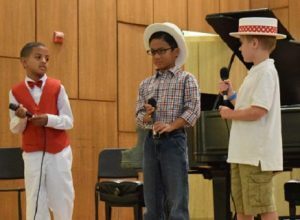 Voice lessons are fun for students at Arlington Heights Music Academy! Our teachers are friendly and patient. Each teacher possesses a university degree and a variety of skills so that each student can progress from beginning to advanced instruction with the same teacher, creating a lasting bond and mutual understanding that can help the student learn in the best way possible. Students will gain an understanding of music theory as well as vocal technique. Once the basic skills of technique, theory, and note reading are in place, students can progress to learning a wide variety of music, including classical, theatrical, and popular styles. We keep students interested in their lessons through a combination of incentives, performance opportunities, and making lessons fun with the use of games that teach as well as entertain. All lessons include the opportunity to win weekly prizes and end-of-year medals through earning points based on at-home practicing. Students are also given the chance to compete in music festivals and theory tests to further increase their musicianship. We also provide three recitals per year as an opportunity for the student to perform! 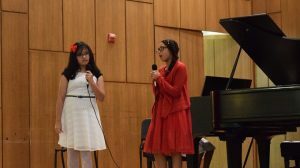 The recitals are a wonderful way for the student to share with his or her family the skills they have learned, as well as having the chance to hear the performances of other students. The benefits of learning musical skills are lasting – experts agree that learning music improves test scores, fine motor skills, self-confidence and problem solving, as well as fostering a love and understanding of the art of music. Vocal technique and musical ability are skills that can benefit the student for a lifetime in a variety of ways. Please contact to enroll today. A 30-day notice is required for early withdrawal. One of the two following conditions will apply: (1) Refunds for withdrawal from classes during the semester will be limited to the tuition for remaining classes minus four week’s tuition. (2) For those making payments in quarters, one payment will be due upon withdrawal. Musikgarten – Because these young students need the security of having class with the same group of students each week, class lessons missed cannot be made up during another class. No refunds or credits will be given for missed class lessons. Private lessons may not be made up except in the case of illness or emergency, and then only if we are notified by 2:00 PM the day of the lesson to be missed. To cancel a private lesson call your teacher at 817-731-2612. Leave a message if he/she is unavailable. No refunds or credits will be given for missed class lessons or un-rescheduled private lessons. No makeup lessons will be given after the next AHMA school session starts. Please remember that tuition purchases instruction time, training and experience. Your lesson time is reserved for you even if you don’t use it. Parental supervised practice is of utmost importance! Parents are partners in the learning process. Gentle encouragement is needed for the student to feel the delight of successful learning. It is very important that a student feel successful at the tasks he or she is attempting. Please encourage daily practice. Younger children should not be expected to do all of their practicing alone. Sing songs together, practice rhythm and note reading exercises together, practice the assigned pieces together. Try to set aside the same time every day for practice sessions, and make it a goal to practice each piece multiple times each day. Practice time is rewarded through our Practice Points program. Students can receive small prizes throughout the year, and end-of-year awards are also given out. Bad weather closing of AHMA will coincide with Fort Worth ISD. Information on school closings is available from radio/TV. Due to scheduling difficulties, bad weather days cannot be made up. Students and parents arriving early should enter through the front entrance and wait for their class in the waiting room (foyer). Parking is available in front and behind the school. Please do not park in the driveway! This blocks students and parents who wish to park in back from entering and exiting.